This verse has become more important to me in recent years. I was diagnosed with brain tumors in 2012–noncancerous but that doesn’t mean they haven’t changed my life. The tumors are a result of a genetic condition called Neurofibromatosis Type 2. Because of NF2 I can get tumors anywhere there are nerves in my body. My tumors are stable now but it took almost 6 long years to be able to say that. I live with the fact that I could develop new tumors or the old tumors could become more serious at any time. I won’t tell you I don’t have challenges in my life because I do. I could live the rest of my life in fear waiting for the next bad thing to happen. I could live the rest of my life being bitter and angry because of all the things I struggle with. I could live the rest of my life feeling sorry for myself. Or I can celebrate each day and be thankful for all the good things in my life of which there are many. One of the things I’ve learned on my journey is that we all have choices to make. We can choose to be afraid. We can choose to give up. Or we can choose to believe God and His promises. We can’t always change our circumstances, but we can always change our attitude about our circumstances. But a change in attitude isn’t just about what we think. Our actions reflect what we think, but I believe the opposite is true as well. Our actions affect our attitudes. For example, when I was at my sickest I could barely move from the chair to the bathroom to the bed. But I decided one day it was time to start exercising again. Exercise is something I’ve done all my adult life except for a few months now and then. The first day back on the treadmill, I’m pretty sure I didn’t even make it five minutes at a very slow rate but I did succeed at a few minutes. The next day I added another minute and so forth. Each time I worked out it affected my attitude but my attitude also affected my actions. The two worked together to make me stronger. 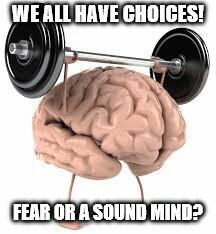 We can choose to give in to the fear or we can choose to believe in God’s power and love and his promise of a sound mind.